Last Saturday my little sister, Tallulah Bee, celebrated her second birthday. 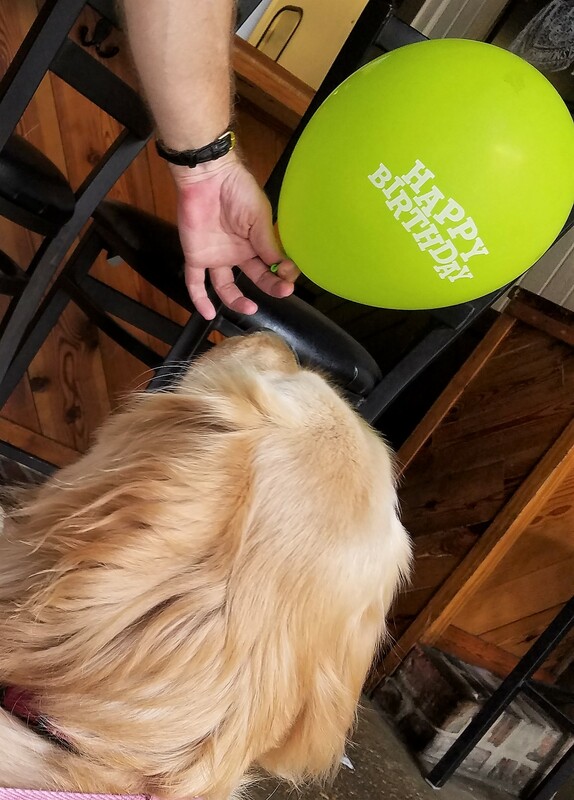 I’m not going to sugarcoat it: Getting to her first birthday was a bit of a challenge at times. But that second year flew by. We marked The Bee’s birthday in typical New Orleans fashion with a big blowout brunch. Shhhh . . . don’t tell my sister this . 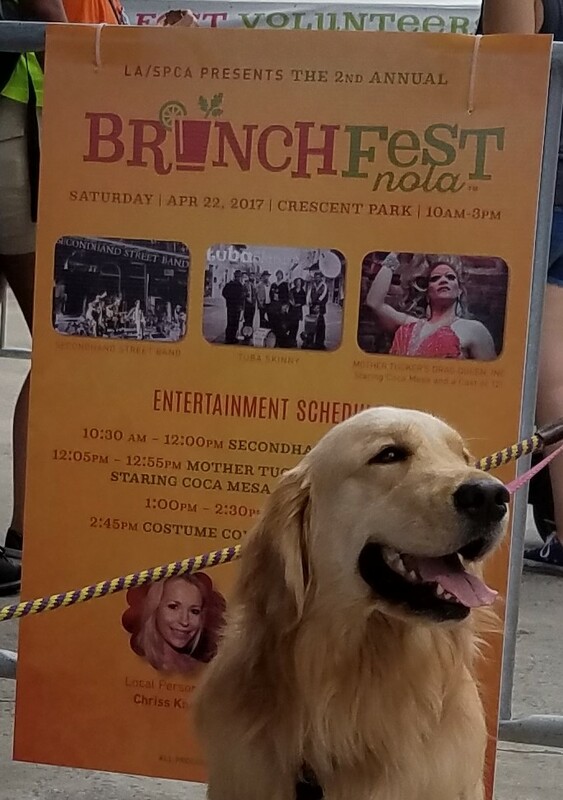 . . BrunchFest NOLA was actually a fundraiser for the Louisiana SPCA, but Tallulah thinks the whole thing was just for her. Let’s just let her believe that. By the way, that little kitty behind us looks a little huge and terrifying. It’s not real, right? Back to brunch. 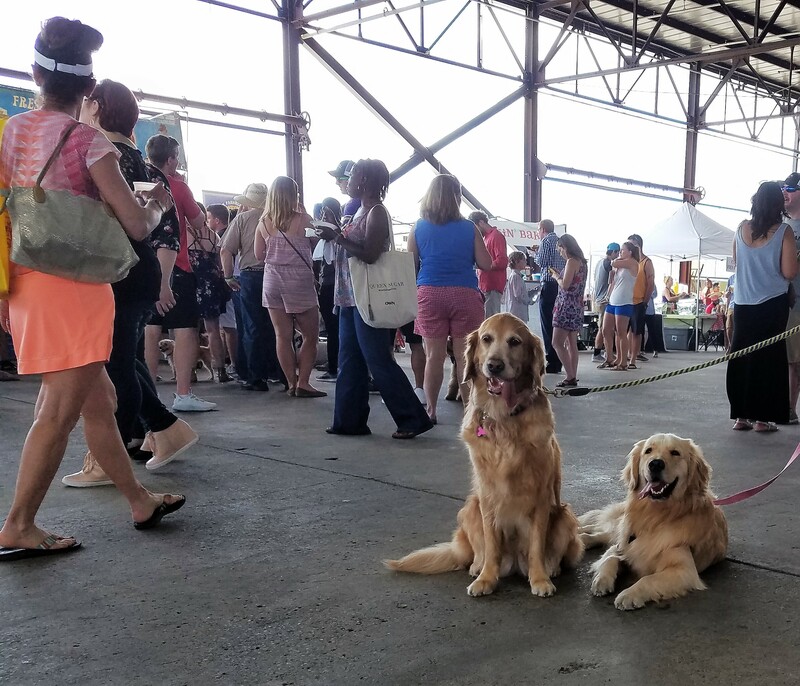 There were food and drink booths there for the humans and lots and lots of people to give us love and other dogs to give us kisses and sniffs. 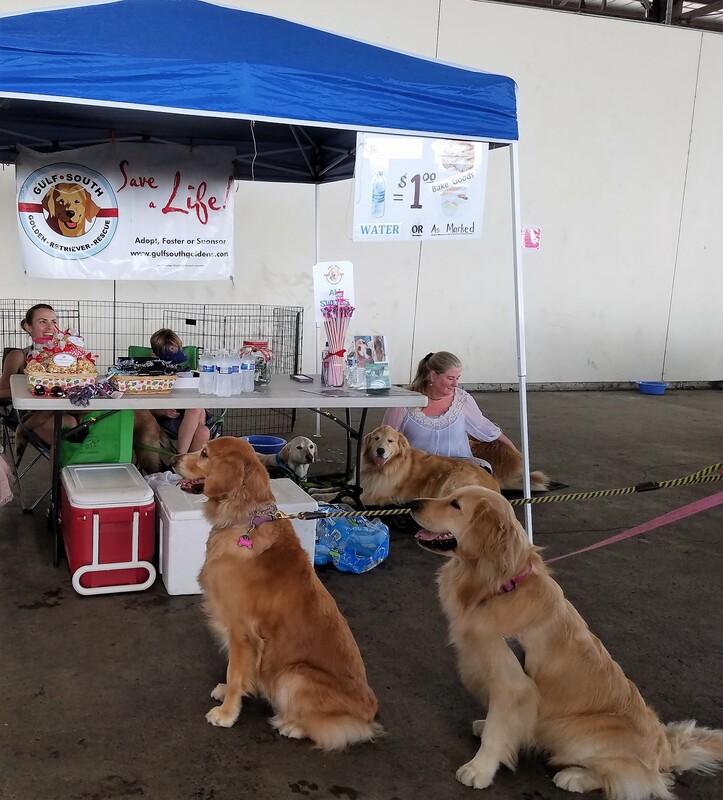 Naturally we had to visit our friends at the Gulf South Golden Retriever Rescue tent. And then we headed to Crescent Park’s big lawn for a little entertainment, which just happened to include a show by Mother Tucker’s Drag Queen, Inc. Drag shows are an integral element to many a New Orleans brunch, and Tallulah seemed to enjoy her first experience. 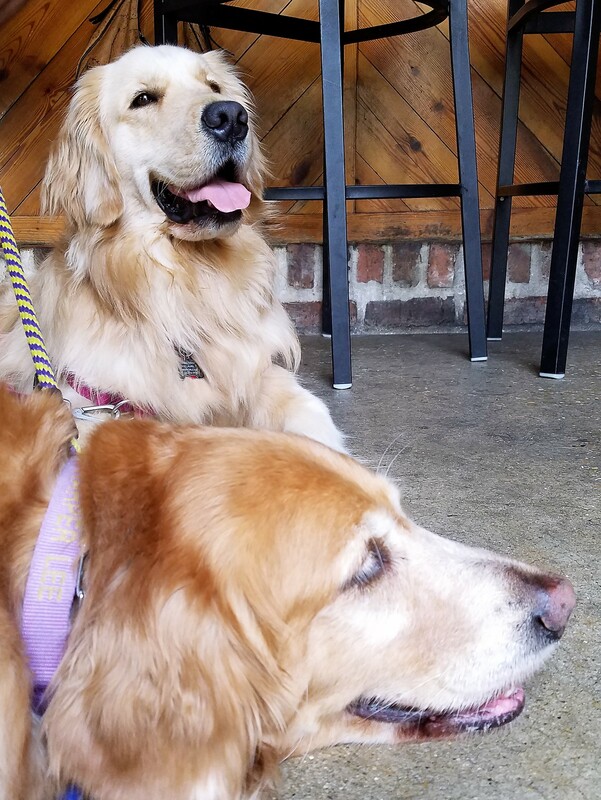 Tallulah still had plenty of birthday energy on the way home from brunch, so we made a little stop at my favorite New Orleans watering hole: The District. I was just happy for the nice cool floor. I guess that’s the difference between being two years old and being eight years old. Judging from Tallulah’s post-birthday-brunch-bash nap, I’d say that the day was quite a huge success. My first two years as a big sister have been some of the best years of my life. Here’s to celebrating many, many more birthdays with my sweet little sister, Tallulah Bee. 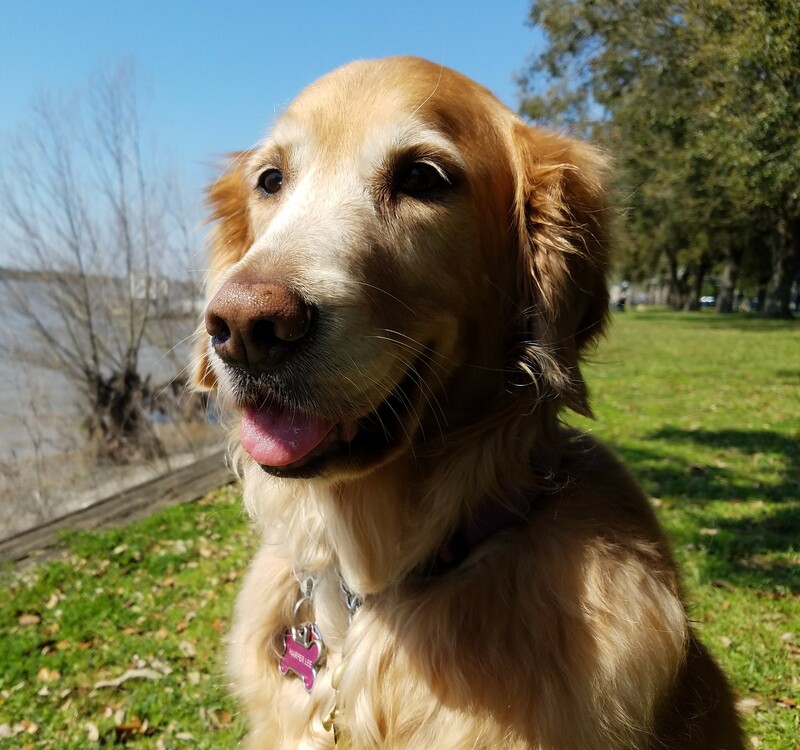 Happy Eighth Birthday, Miss Harper Lee! A note from Harper Lee’s mommy . . .
Today is Miss Harper Lee’s eighth birthday. 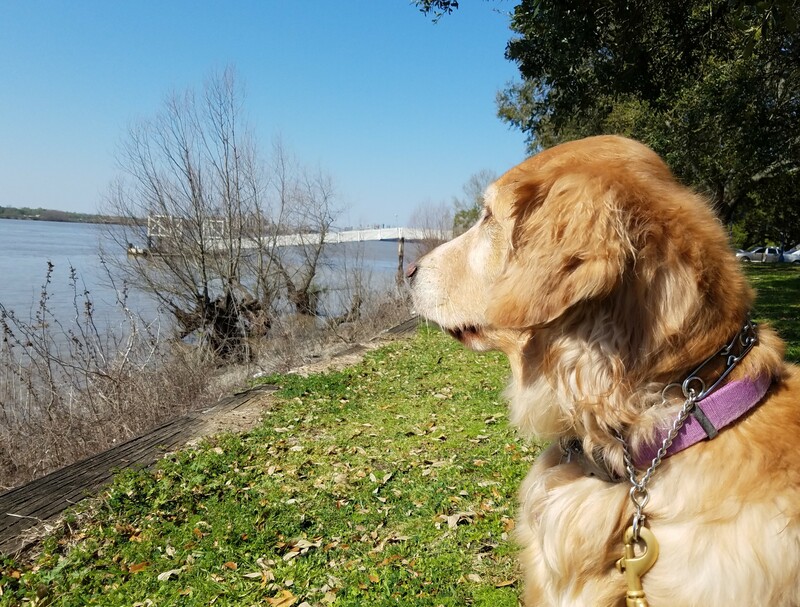 She and I celebrated a little earlier this week–just the two of us–with a visit to the edge of the Mississippi River. 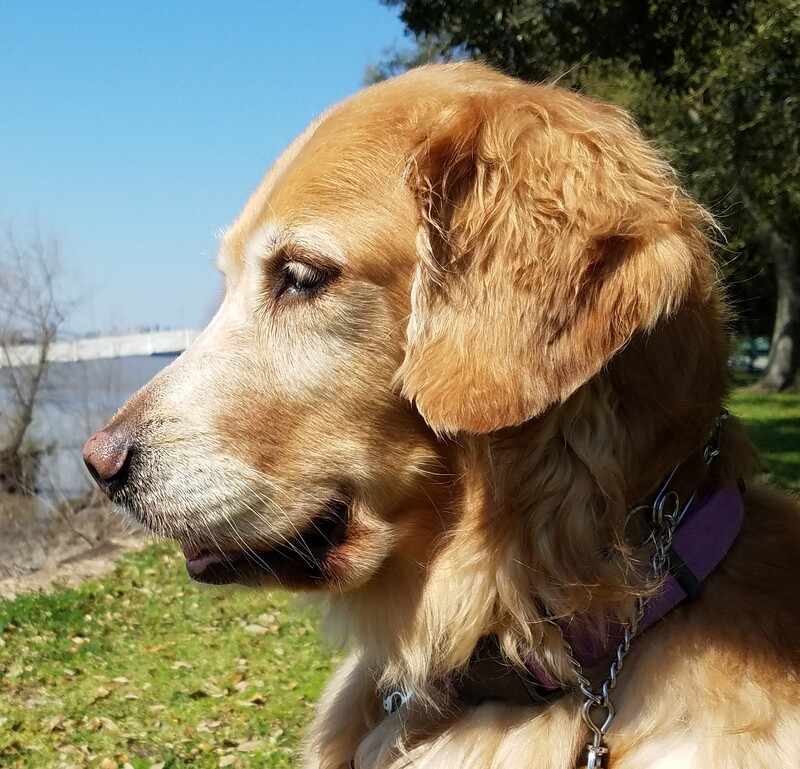 We watched the barges travel up and down the river, she watched the squirrels travel up and down the trees, and we reflected on eight great years. I couldn’t have asked for a more amazing dog. She’s sweet and smart and eager to please, and she’s been all of those things every day since the first day her human daddy and I met her. 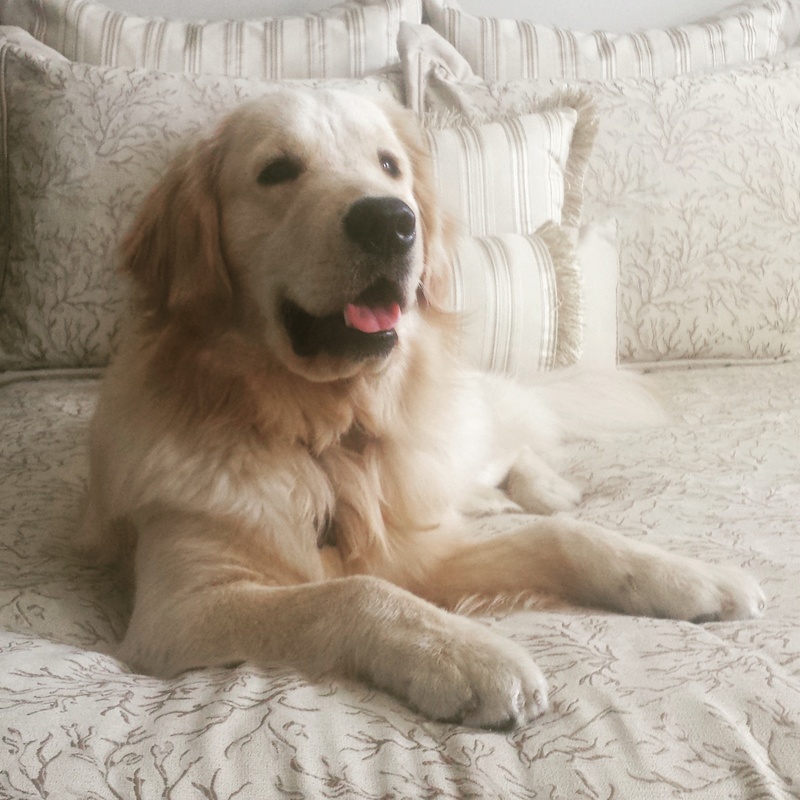 As much as I try to deny it, eight is sort of getting up there for a Golden Retriever. I have no idea how many more years we have ahead of us, but I do have a promise for my sweet girl: Your health and happiness will be my priority, and I will make every day an adventure filled with love. 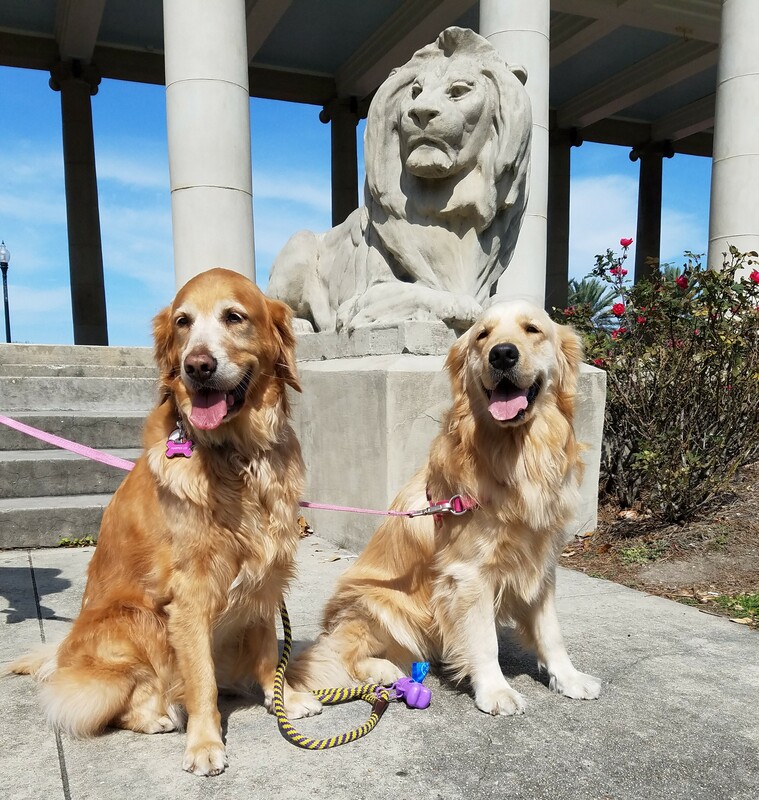 This time last year, my humans and I created our own little 2016 photo challenge: Select one location and go there once a month to take a photo of me with my sister, Tallulah Bee. 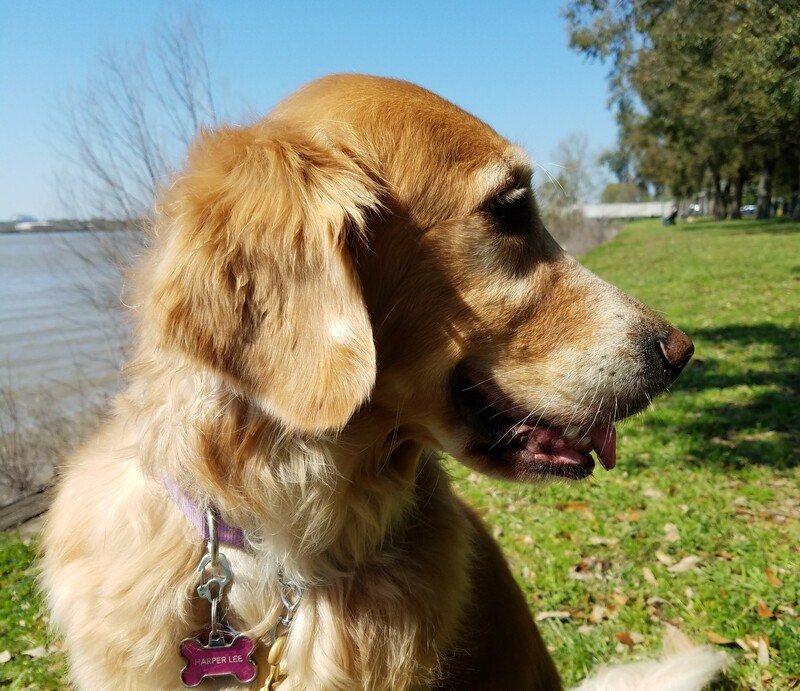 We chose a little willow tree in New Orleans’ Audubon Park, partly because we knew a willow tree would change throughout the year but mostly because it was close to the parking lot and we knew that in summer’s peak heat we’d want a location that wasn’t too much of a hike. We decided to take the monthly photo at the end of each month (mostly due to procrastination) and in the morning (due, again, to the heat that we knew would make summer photos challenging). We posted our pictures each month on Instagram. Today I’m sharing our year in pictures with you. After our January photo, Mommy wondered if Tallulah Bee would ever learn to look at the camera (#easilydistracted). By the time February rolled around, the duck population in the pond behind us had greatly increased since the previous month, adding immensely to the degree of difficulty in getting a good photo (#yummyduckpoop, said Tallulah). In March, we had zero cooperation from my little sister. She was obsessed with sticks and water fowl . . . anything but the camera. That’s ok. I managed to notice that the grass was turning green again, and our sweet little willow tree was budding out. I also managed to smile for the camera (#professional). April was full of showers, which the little willow tree definitely seemed to enjoy (#muddypaws). Tallulah and I should have enjoyed the last of the cool spring temperatures. By May we were starting to feel summer’s heat and appreciating that decision early on to pick a photo spot that was close to the parking lot (#melting). June’s photo was technically taken the first weekend in July. It was the only month throughout the year that we cheated; but notice that Tallulah was finally looking at the camera . . . more or less (#smallvictories). 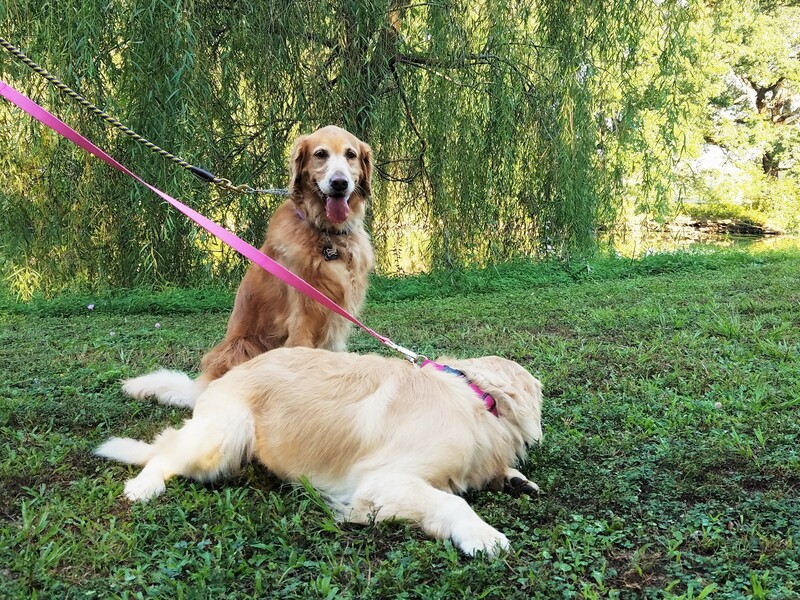 Our July photo was taken on a super hot morning, so I opted for a little rest in the cool grass . . . which made Tallulah look like a giant (#perspective). 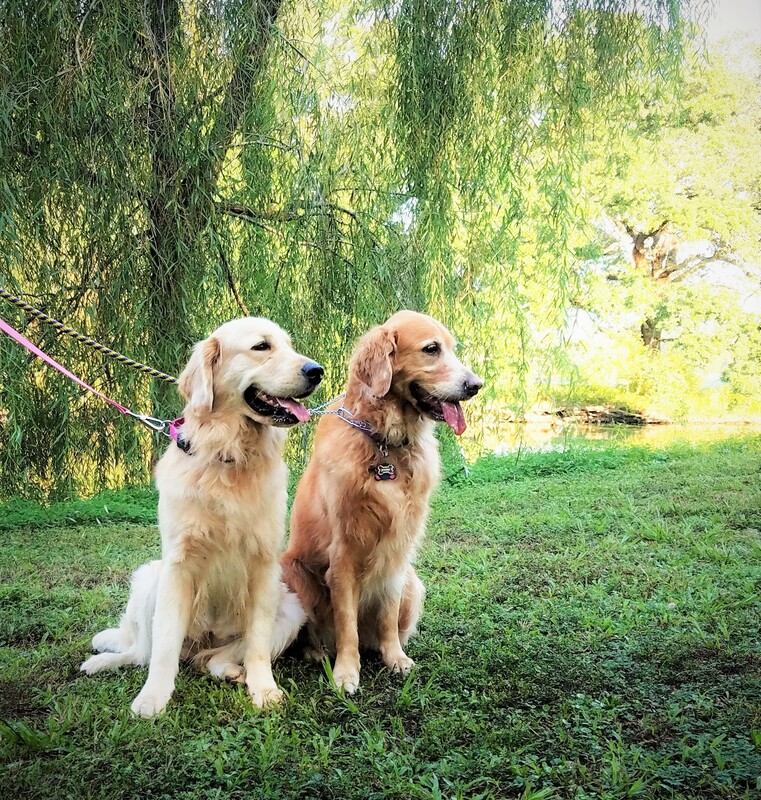 The next picture pretty much sums up our August photo shoot in front of the little willow tree. Despite the unbearable heat, I was ready to pose. And Tallulah? She just wanted to eat grass. 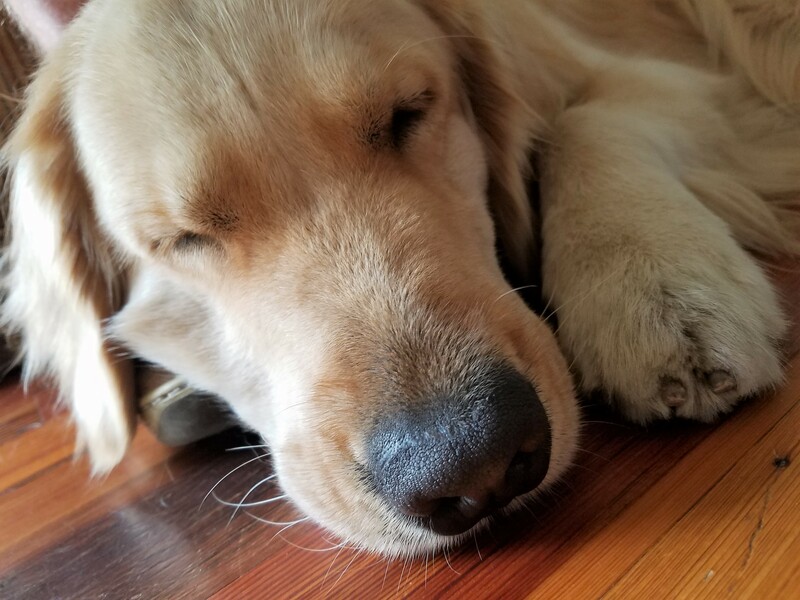 Mommy wondered how much longer we could use the “she’s a puppy” excuse (#excusesexcuses). We thought (hoped) August would be our last sizzling monthly photo session in Audubon Park. Wrong! Tallulah and I were desperately looking for autumn (#farinthedistance). 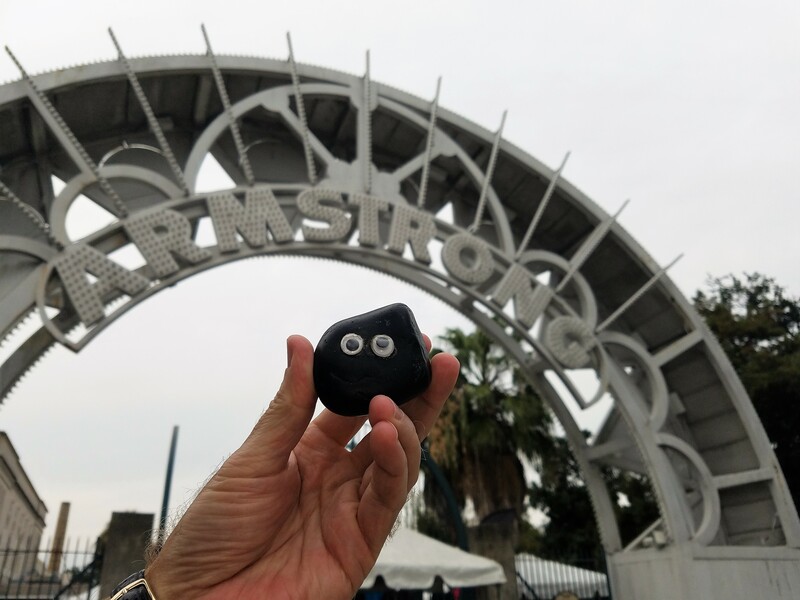 It’s been a while since I’ve given you an update on Bashful’s New Orleans adventures. Every time I turn around, that little fella is hopping into my human mommy’s purse and they’re headed out the door. I finally got those two to sit down long enough to tell me where they’ve been and to share a few photos. Wow. They’ve been busy. 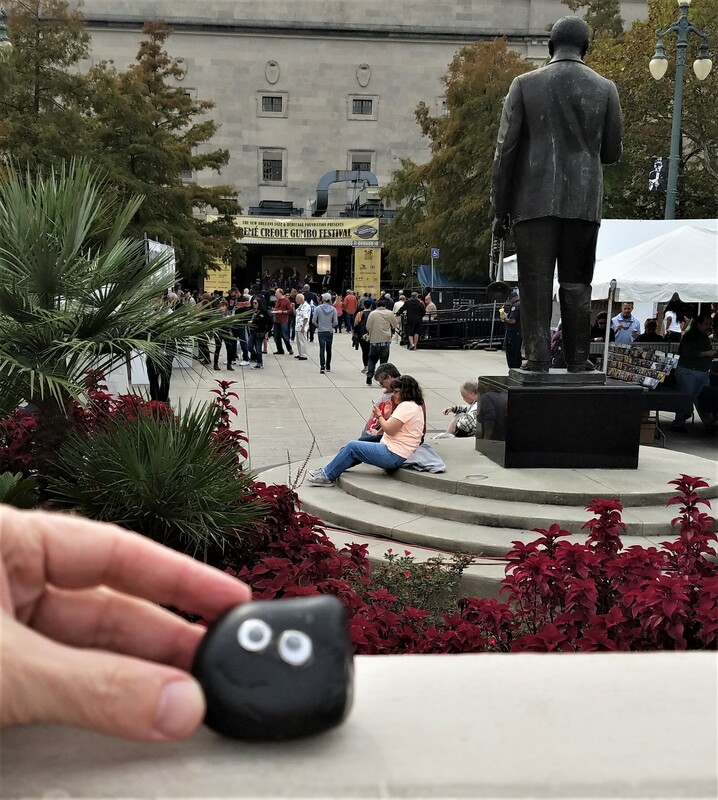 A couple of weekends ago, Bashful joined both of my humans at Armstrong Park for the Treme Creole Gumbo Festival–New Orleans’ Premier Brass Band Showcase, which is presented by the New Orleans Jazz & Heritage Foundation. 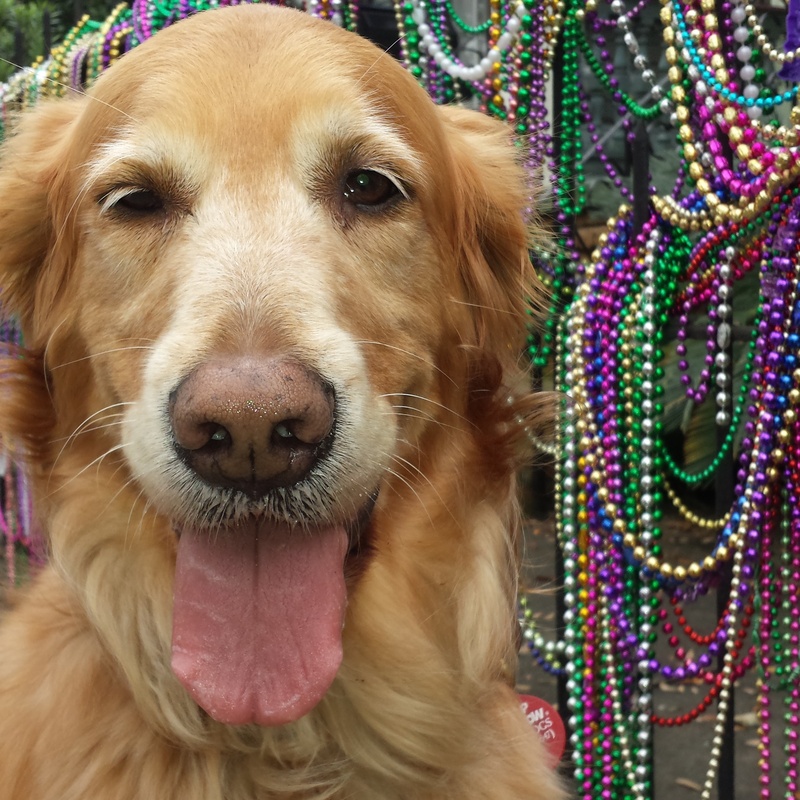 In New Orleans, we love a festival. There’s at least one every month–sometimes one each weekend of the month–and they usually revolve around tasty food and great music. This festival features gumbo of every sort you can imagine: creole gumbo, seafood gumbo, chicken and sausage gumbo, even vegan gumbo and smoked tofu and Portobello mushroom gumbo. (Just for the record, Mommy doesn’t recommend those last two.) 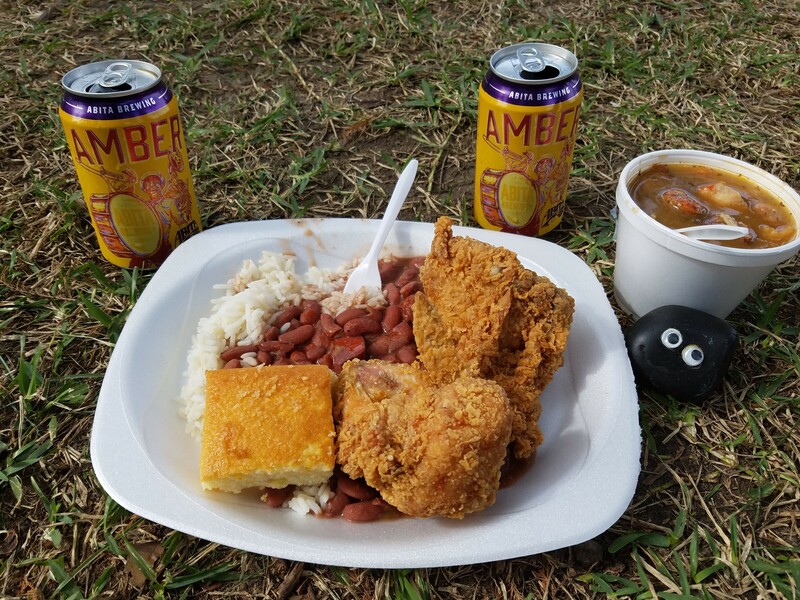 Bashful had quite an appetite that day, so he also tasted some red beans and rice served with fried chicken and corn bread. (Mommy had a little bite of the fried chicken. She said it was one of the best things she’s ever eaten. She’s still talking about it.) 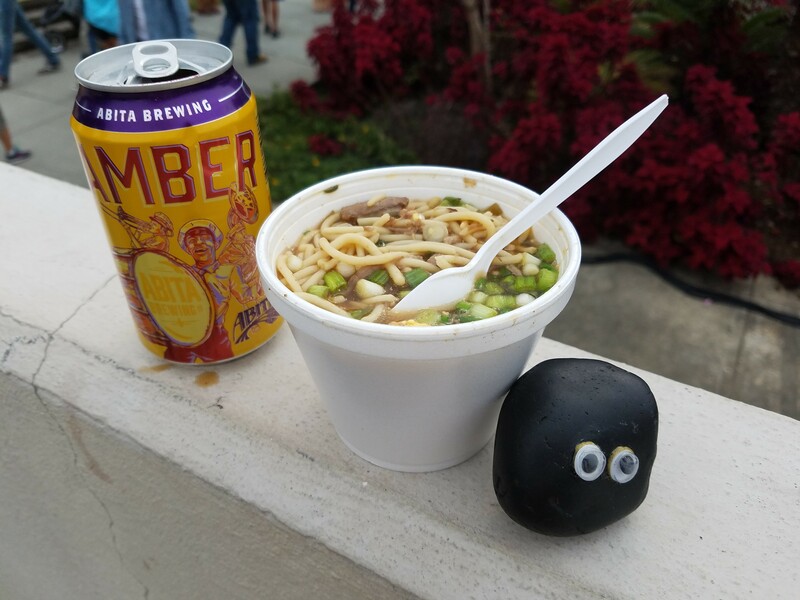 Naturally, Bashful chose to chase down his festival food with a couple of local Abita Brewing Company Amber beers. With his taste buds satisfied (for the moment), it was time for Bashful to enjoy some brass band music. Brass bands are a new Orleans tradition. Rebirth Brass Band, Hot 8 Brass Band, and the Original Pinettes Brass Band, an all-female group, are some of the more well-known groups. Bashful settled in and listened to a few songs by the Panorama Jazz Band. 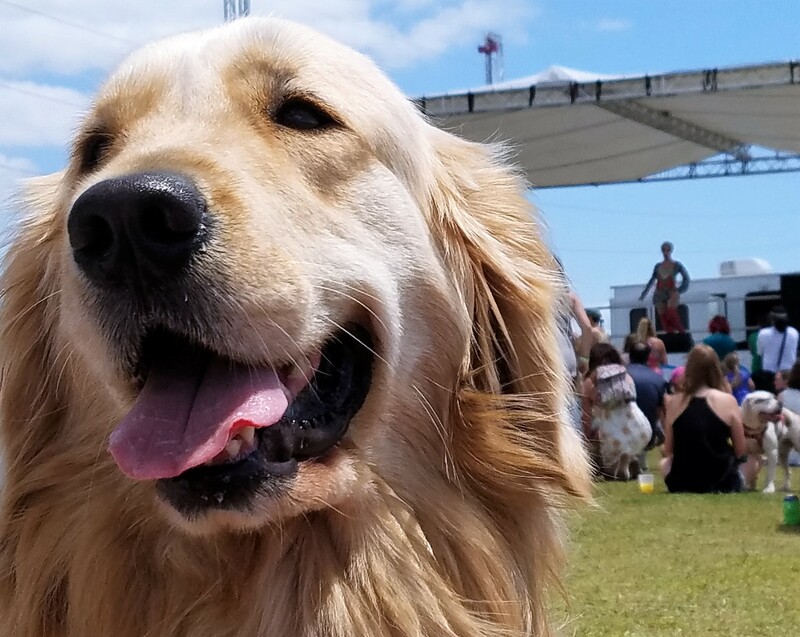 It was my humans’ first time to see them perform, and they had every bit as much fun as Bashful. If Bashful keeps drinking that Abita Amber beer, he just might need another helping of Miss Linda’s famous ya-ka-mein. 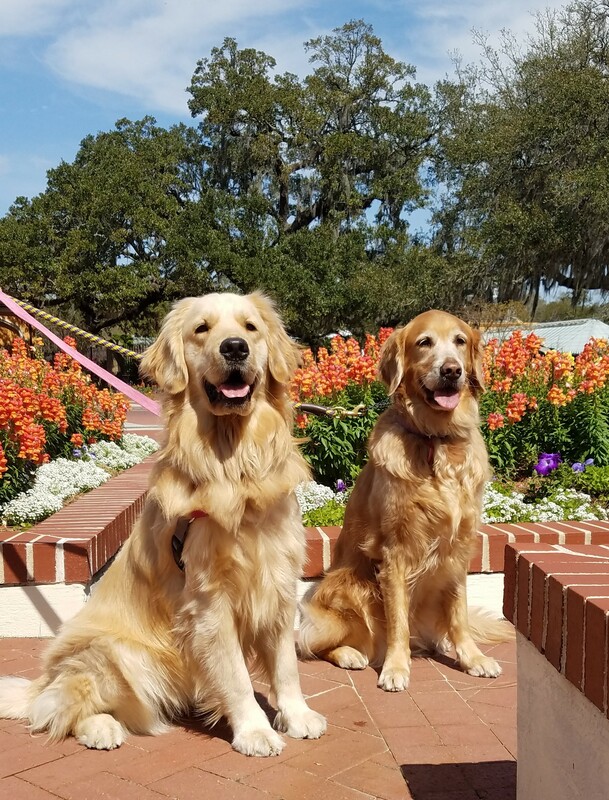 Each month this year, Tallulah Bee and I have joined our humans for a photo session in New Orleans’ Audubon Park. We pose on about the same weekend each month (the third or fourth weekend), at about the same time of day (early morning), and at the same spot (in front of a little willow tree that stands next to a pond). When we finished our August photo shoot, we really thought we were saying goodbye to the miserable hot days of summer. Wrong. 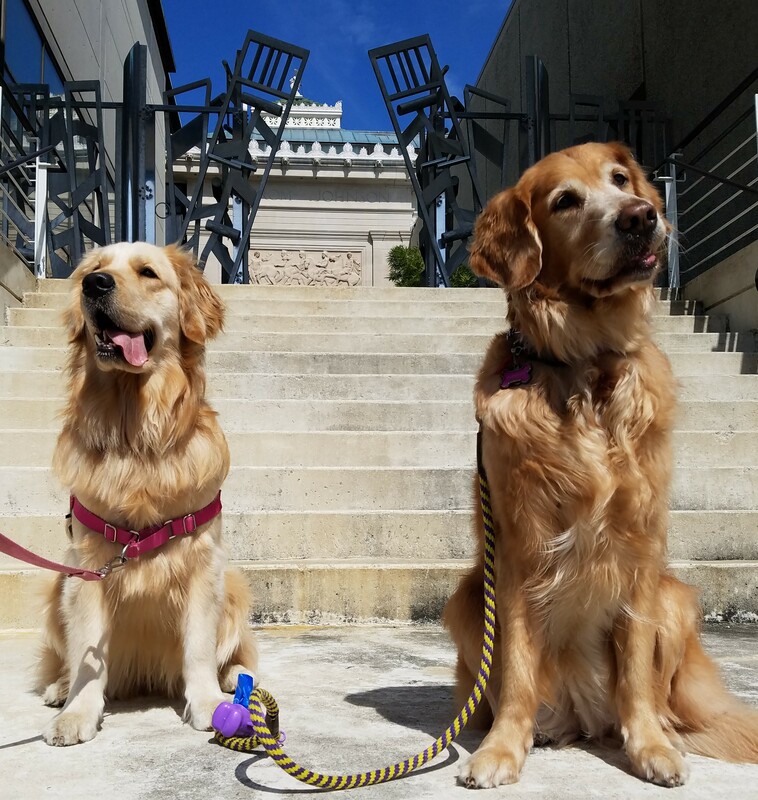 A few days ago, with tongues hanging out, Tallulah and I did our best to look cool for our sizzling September entry. The weather humans have confirmed that this summer has been unusually warm hotter than blazes: 43 nights during which the temperature did not drop below 80 degrees, shattering the previous record of 13 set in 2010. Enough, Mother Nature. We’re ready for a cool, crisp photo shoot in October. And a little more about our monthly photo sessions in the park. Mommy never ever gets “the shot” on the first try. Tallulah is easily distracted, so it takes a little time and effort. Thank goodness for digital photography! 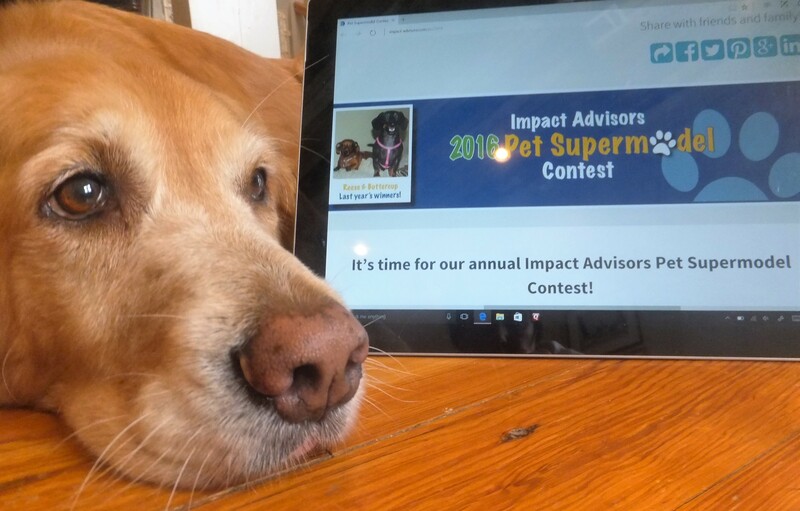 Just a quick reminder that voting in my human daddy’s company Pet Supermodel Contest continues. Thank you so very much for all your votes so far. 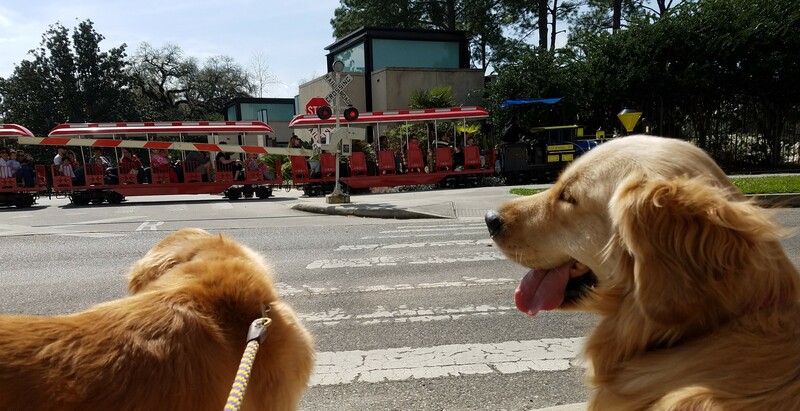 As I dictate this blog post to my human mommy/blogging assistant/typist, I’m in fourth place (with 156 votes) and Tallulah is in fifth place (with 147 votes). Our chances of catching the leaders are pretty slim. (A couple of cats are hanging on to first place with 555 votes and two dogs are in second and third, one with 546 votes and the other with 241 votes.) I’d cry foul and ask for an inquiry into voter fraud, but they’re all pretty cute, so I’m sure the vote count is legit. Anyway, we have a couple of dogs in an inflatable boat who are gaining on us, so remember to vote early and often . . . totally legal in this case. You can click here for a link to the ballot box to cast your vote for me. You can click here for a link to the ballot box to cast your vote for Tallulah. 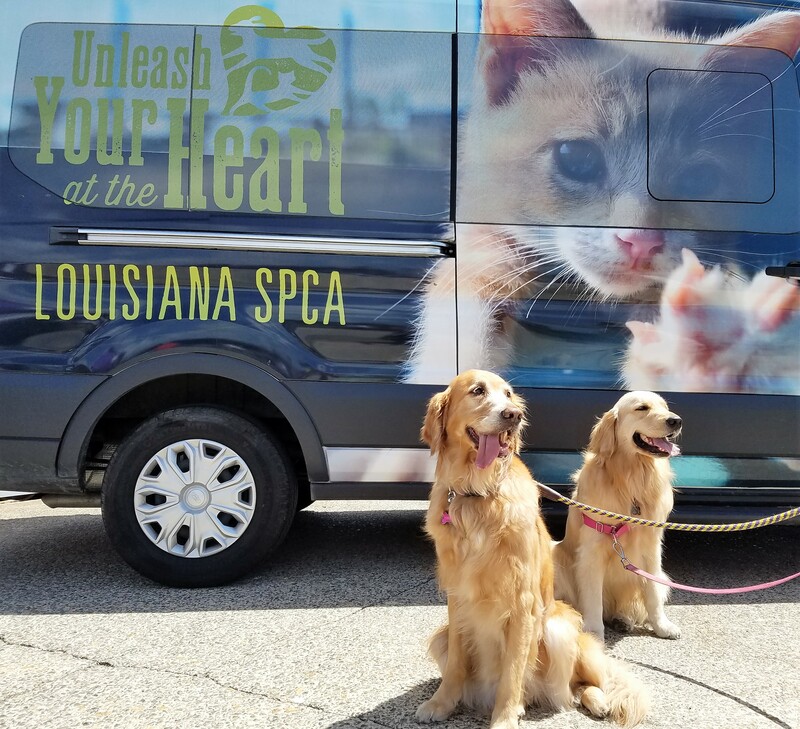 Remember: One vote per pet every 24 hours and voting closes at 5 p.m. central time Friday, September 30. Thank you! P.S. Please feel free to share! 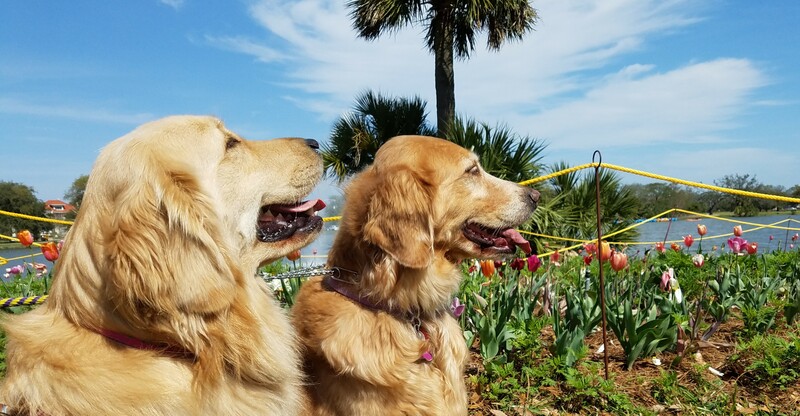 Each month since January, my little sister and I have posed for a photo in front of this little willow tree in New Orleans’ Audubon Park. Click here to see how much has changed in the last six months. 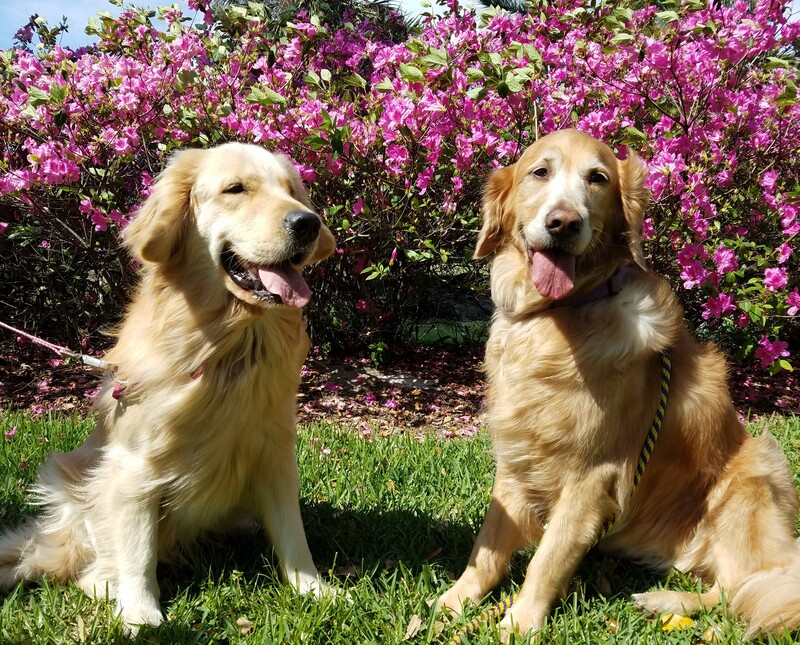 Thank you to Black and White Sunday Blog Hop hosts Dachshund Nola and Sugar the Golden Retriever.